Today's print is very simple: just a snap-around bed frame to model the wooden frame around our king-size bed. As you can see in the picture, we've chosen the smallest of the bedrooms to be our "master" bedroom, and the bed will take up pretty much all of the room. The closet at the bottom of the picture is part of this bedroom, but the other closet is actually a piece taken out of this small room to make a closet for the bedroom to the right. We made the actual larger "master bedroom" into the office (Day 255), with the thought that we'd rather have extra room while awake than asleep. Settings: MakerBot Replicator 2 on .3mm/low, as usual. 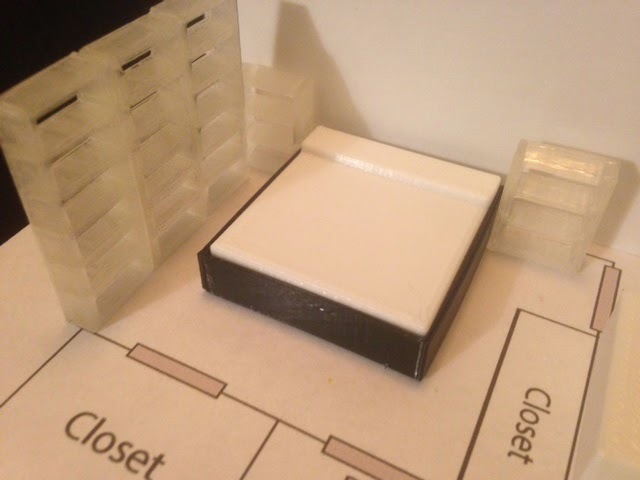 Technical notes, easiest-OpenSCAD-code-ever flavor: The design is just a sharp cuboid (see Day 248) with a smaller one taken out so that the bed can fit inside.